Dip each of your bacon strips in your whiskey then in the brown sugar and place on a baking sheet. Press remaining brown sugar into bacon. Bake for about 15 minutes, flipping half way through until done. Remove from oven and let cool, then slice in half. Meanwhile on stove in small pan melt your butter then add your diced onions and saute until translucent, add in brown sugar and let caramelize, remove from heat. To make your burgers mix together your ground beef, brown sugar, garlic powder, salt and pepper and form into 3 1/3 lb patties and place on your smokeless grill. Cook for about 5 minutes on each side until desired doneness, top with cheese and remove from heat. 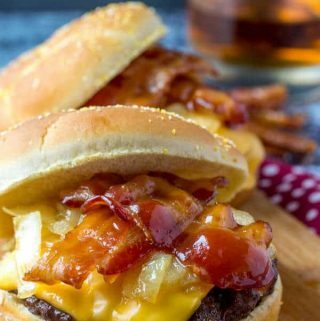 Place burger on bun and top with sliced bacon and onions.